【Material】Our door closer is made up of high quality aluminum for anti-rust protection.Tested to endure over 500,000 open/close cycles. Works for right or left handed closing doors. 【Good Performance】With a function of stopping at anchor point of 90 degree and no anchor point of 180 degree.Double speed, closing speed and Latching speed are adjustable.For both left and right doors. 【Two Independent Vales Design】With two independent vales you can control both the sweep motion and the catch closing. Self regulate the mechanism to suit your needs.Choose your return close speed to suit the environment in which the closer is placed. 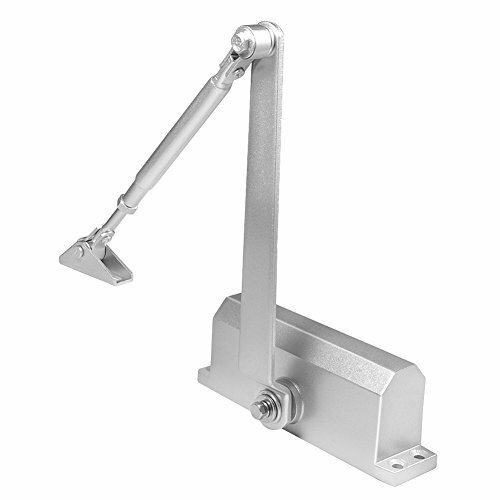 【Application】Our Heavy-Duty Door Closer is Suitable for the door weight of 45-60kg.The max width of door is 600-1200mm.It is designed for many different door applications.Great for Home Office Right Or Left Swing Doors. 【Package Including】It will come with a variety of hardware and brackets to make it adapt to almost any installation scenario.Included All Mounting Hardware:Parallel arm ,Regular Arm Installation or Top Jamb Installation.Also an english manual included makes it very easy to install.